Strong group identity is something of a double-edged sword for social justice movements. On the one hand&#151as discussed in part one of this series&#151it is absolutely essential. There can be no serious social movement&#151the kind that challenges the powerful and privileged&#151without a correspondingly serious group identity that encourages a strong core of members to contribute an exceptional level of commitment, sacrifice and heroics over the course of prolonged struggle. On the other hand, a group’s identity tends to grow stronger and more cohesive at a cost of becoming more distinct from other group identities. The cost is the barrier that results from the distinction of said group from other groups. While this is true of all groups to some extent, it tends to have particular consequences for political/politicized groups. Take, for example, a sports team that defines its group identity partly in distinction from rival teams. The team is likely to play all the harder against their rivals as a result of the distinction. No problem there. A group engaged in political struggle, on the other hand, has not only to foster a strong within-group identity; it also has to win allies beyond the bounds of that identity &#151 if it is to orchestrate and leverage the power it needs to accomplish its political goals. Add to this that oppositional struggle tends to trigger an oppositional psychology, which can inject “with steroids” the natural tendency of groups to differentiate themselves from outsiders. I have called this tension (or double-bind) the Political Identity Paradox. Good leaders have to perform an extraordinary balancing act between the conflicting imperatives of building a strong within-group identity and connecting with allies and potential allies beyond the group. Of all the dimensions along which forms of social capital vary, perhaps the most important is the distinction between bridging (or inclusive) and bonding (or exclusive). Some forms of social capital are, by choice or necessity, inward looking and tend to reinforce exclusive identities and homogeneous groups. Examples of bonding social capital include ethnic fraternal organizations, church-based women’s reading groups, and fashionable country clubs. Other networks are outward looking and encompass people across diverse social cleavages. Examples of bridging social capital include the civil rights movement, many youth service groups, and ecumenical religious organizations. Bonding social capital is good for undergirding specific reciprocity and mobilizing solidarity. Dense networks in ethnic enclaves, for example, provide crucial social and psychological support for less fortunate members of the community, while furnishing start-up financing, markets, and reliable labor for local entrepreneurs. Bridging networks, by contrast, are better for linkage to external assets and for information diffusion. …a primary function of identity is for group members to signal belonging and commitment to the group, thereby contributing to the health and well-being of the group, while also securing one’s individual place (and therefore survival) in the group. Commonality: I am like others in this group. I share values with this group. I belong in this group. So, the “double edged sword” of group identity that I described above&#151the Political Identity Paradox&#151speaks to the need for groups engaged in political struggle to develop both strong bonding and strong bridging. Without strong bonding, group members will lack the level of commitment required for serious struggles. But without strong bridging, the group will become too insular and isolated to be able to forge the broad alliances that are even more necessary for achieving big structural changes. We can talk in terms of within-group vs. between groups, distinction vs. commonality, differentiation vs. universality, or bonding vs. bridging. However we phrase it, what we’re talking about is the tension between the imperative for groups to cultivate internal solidarity and the imperative to connect beyond the boundaries of the group. 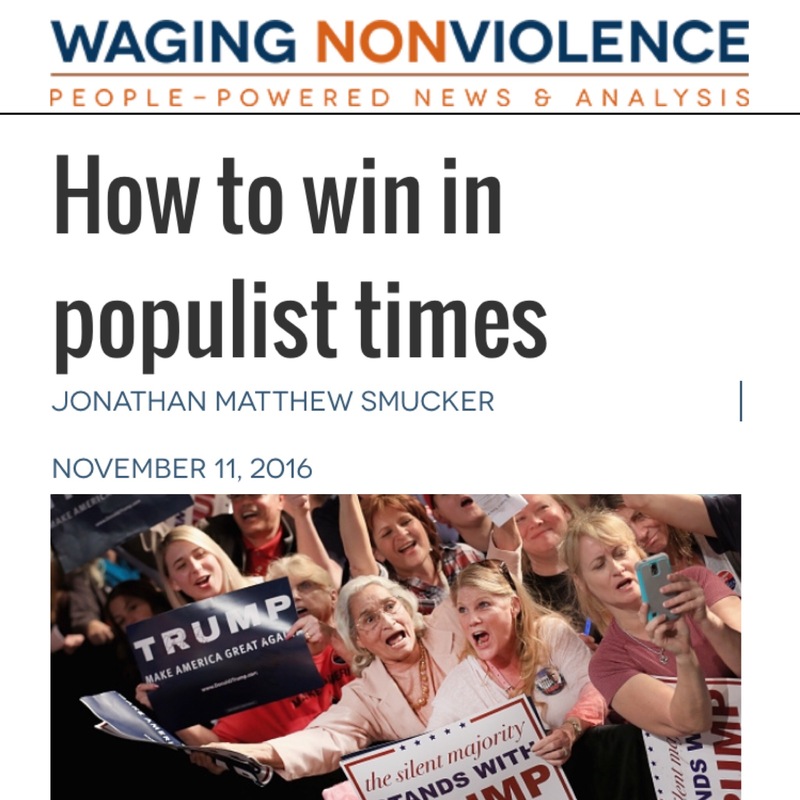 Understanding this tension is crucial for understanding the emergence of&#151and the obstacles to&#151populist alignments.